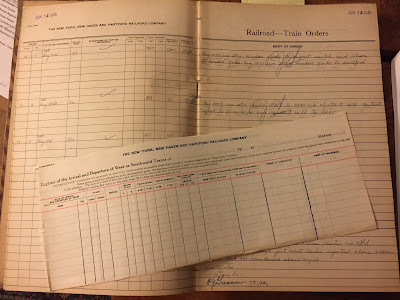 I don't think I mentioned it before, but some time ago Max came across a cool log of New Haven RR train orders. It was available, it included orders for Valley Line and Air Line trains, so I had to get it. But it's only been recently that I've been mining it to raise the level of authenticity in my operating sessions. I've been using actual NHRR Form 19 "flimsies" since the beginning to govern operations on my layout, but now not only will I be able to have the proper general language for train orders, but in some cases the actual, exact language for specific trains. The only thing different will be the dates (this logbook is from 1945 and I model c. 1948). 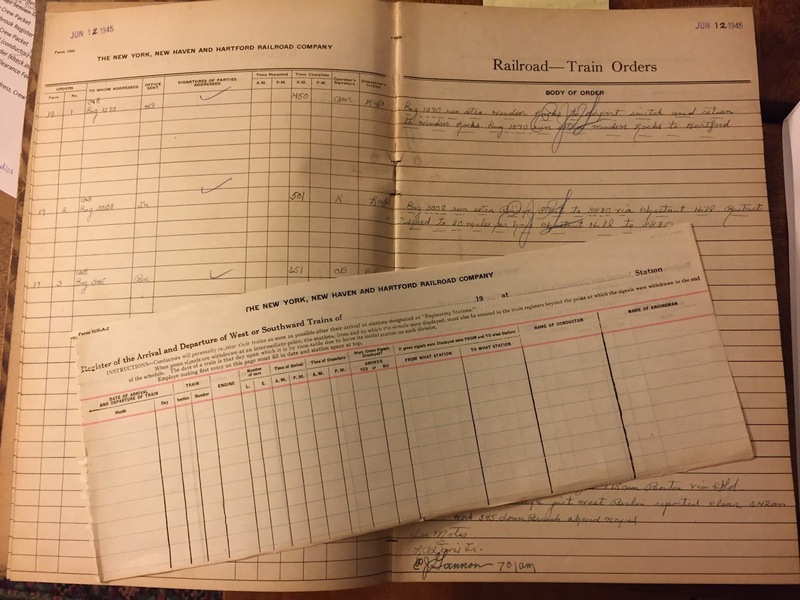 I also have a NHRR train register in my collection. According to the instructions, "Conductors will personally register their trains as soon as possible after their arrival at stations designated as 'Registering Stations.'" I've been using it as my "guest log" which crew members sign to "clock in" at the start of an operating session. After my most recent session though, it occurred to me that I could use it as the basis for a train register form at each of the stations on my layout. Up to now, conductors had to see the Station Agent (usually me, manning the desk and Saybrook tower control board) and report the number of cars in his train, as well as get the work in town and any new orders. But acting as agent and tower operator at the same time is difficult, to say the least. So I'm considering installing bill boxes at each station to hold orders and switchlists. But also at each station - just like on the prototype - the conductor will be required to sign the register and report the number of cars, as well as the time. And though it's authentic, it's not just busy work - it actually serves an important role on a model railroad, giving me the train length and time data I need to tweak traffic and session duration. BION, Ted Dilorio found the long boxes and posted about them on his blog at about the same time I found them, totally independent of each other. Strange coincidence - then again, maybe not. Model railroaders are always seeking to adapt stuff. Using either one of these will save me having to make them - and they only cost $1(!) so it's a no-brainer. Just need to decide which one to use. The one on the left looks more "bill boxy", despite the country look of the handle (though the handle provides a convenient attaching point - I have to remove one of them though). But it would require paperwork to be folded and it's too narrow for anything to be propped up in it. 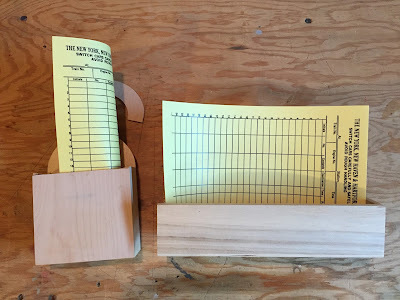 The one on the right is a little more useful - it doesn't require as much paperwork-bending, and you can prop up your switchlists and such in it if you want. Only issues are that it sticks out into the aisle more, and it's a little more difficult to attach to the fascia. Until I decide, I'll probably just hang small clipboards from cup hooks screwed to the fasica - or just use binder clips clipped to the top of the fascia (where I can). But in the meantime, I'll enjoy looking over some old train orders from 72 years ago . . .
Great minds think alike Chris! LOL. 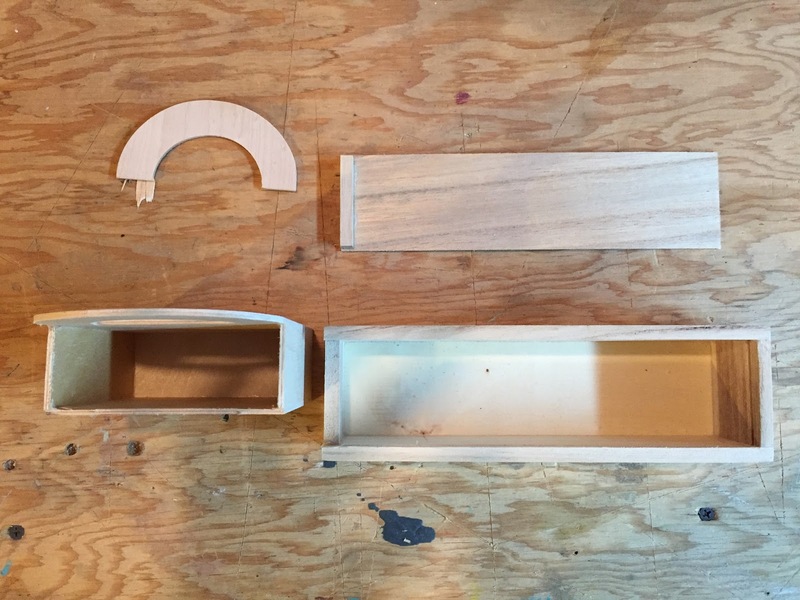 Ralph Heiss uses the box on the left in your post for his bill boxes on his layout. 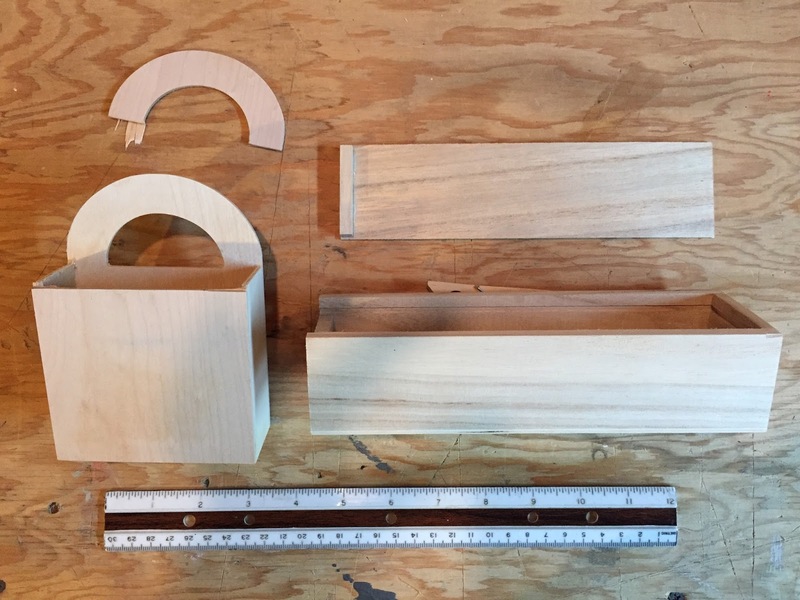 I wonder if throttle holders could be worked out of these boxes? Tuesday Tip: The "Agent's Office"
Milestone Monday - First Full Ops Session!